It is no secret that Kia is trying to change their image. The company has come out with vehicles that will make you do a “double-take.” If you aren’t sure what I am talking about I have one word for you—Soul. Then of course there is the Spectra replacement—Kia Forte. The Forte is really the focus of our attention today as news comes across the wire that Kia has one its first-ever motorsports event at the Barber Motorsports Park. Racing you say? 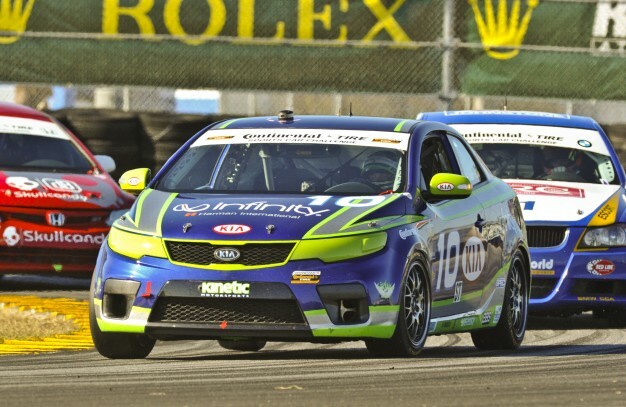 Yes, indeed we do and Kia is serious with their entry of the Forte Koup (actually a pair of Koups) into the Grand-Am Continental Tire Sports Car Challenge in the Street Tuner class. This isn’t the first time that the Kia Forte has caught our eye here at AllSmallCars.com; back in 2009 we were pleased to see the introduction of the 2010 Kia Forte and were longing for the Forte Koup. In fact, we know of one buyer in Canada that bought a Kia Forte Koup based on an ASC recommendation—and that is nothing to sneeze at. That aside, the win for Kia in the motorsports category could come at a better time with the coming launch of the SX trim—as sports-inspired package—on four models in the Kia family line-up: Forte, Optima, Sportage and Sorento. We also wonder the same as some of our industry colleagues, like Car and Driver, as to whether the motorsports win and enthusiasm will spillover into aftermarket performance products for the Kia Forte and Forte Koup. We know there is a market for the Scion tC and the Honda Civic (evident from the Honda also competing in the Grand-Am series). Either way, if you are looking for a well built, well priced and fun to drive compact car, the 2011 Kia Forte should be on your list. At a starting price just under $14K, you might be surprised what all comes wrapped in the sporty looking package. On-track results prove that entry-level can be fierce competitors. Congratulations go out to the Kinetic Motorsports tream and Kia Motors for their success so far in 2011. We will be watching for more winning news from the lime green and blue Koups battling it out in the Grand-Am series. Will Sensual Design Details Lure Buyers Inside Greener Cars?